Born at Northampton, Mr. Fred Cowley came to Rushden in the 1880s as an insurance agent, with his wife Mary Ann (born at Leeds). They opened a 'fancy repository' shop in Church Street in the 1890s. 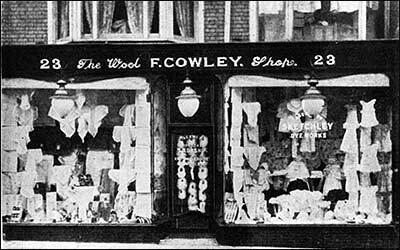 By 1900 they had moved into 19 High Street, and by 1908 had moved to this shop at 23 High Street, and were now selling wools and drapery. Plate Glass Smash—A plate glass window measuring about twelve feet by twelve feet, in Mr. F. Cowley’s shop, High-street, was smashed into hundreds of pieces on Monday dinner-time by one of a flock of sheep that were passing at the time. “Silly as sheep” seems true as the occasion since the addle-pated animal dashed ferociously at its own reflection, which, with the glass, it completely demolished! The glass was nearly half-an-inch in thickness. Unlucky Window. Several weeks ago a plate glass window in Mr. F. Cowley’s shop was smashed by sheep and within the past few days the window has been replaced. The new window is cracked from the bottom, two or three feet upwards. The afore-mentioned “addle-pated” muttons are not responsible this time! Illness—We learn this (Friday) morning that Mr. F. Cowley, who lies rather seriously ill, is not any better. His friends all wish him a speedy recovery and continued improvement. Note: Fred was buried in Rushden Cemetery on 4th October 1923, aged 60 and is commemorated on Grave No. C475.